Learning how to make fudge is lots of fun for the whole family. Not every batch of homemade candy will turn out perfect when you're just beginning, but you'll find that even your mistakes taste good. Unless you seriously scorch the sugar mixture, nothing ever goes to waste. There's even a vintage recipe for Educated Liberty Fudge for you to practice with. As your candy making improves, you'll find the demand for your fudges will increase. That's because everybody will love its old fashioned taste. 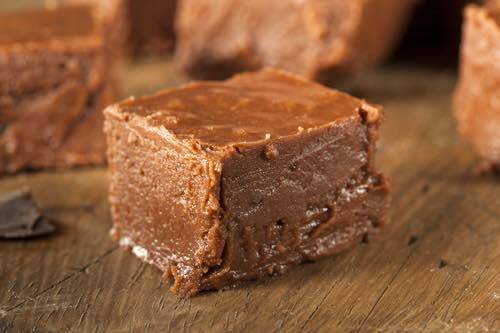 Ever since fudge was invented in America in the late 1890s, it has been the perennial favorite among lovers of homemade candy. Some call it the Queen of Candies because it tastes so rich and delicious. Candy lovers enjoy its smooth, creamy, melt-in-your-mouth taste, and if you're careful to follow the three steps given below, you'll always be able to make the best fudge imaginable. Cook the chocolate with the milk or cream, and stir constantly until the mixture is creamy smooth to prevent curdling. Add the sugar and keep stirring the mixture until it boils to keep the mixture perfectly smooth. Once the candy is cooked, cool it to lukewarm before beating, to prevent graininess, then beat it well to add air to the mixture and make it creamy smooth. During the cooking stage, always test the mixture in cold water. You should remove the candy mixture from the fire immediately after it reaches the stage mentioned in the recipe; for example, soft ball, firm ball, and so on. Then, pour the cooked fudge into a shallow pan to cool and remember to score it with a knife while it's still warm, so it can be easily cut later. 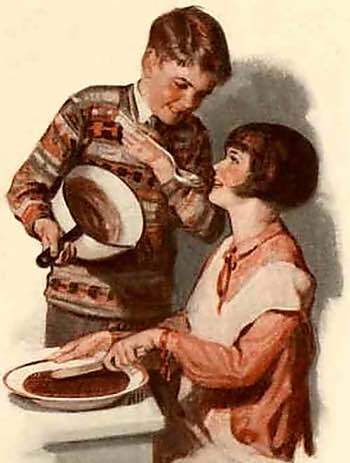 After World War One and throughout the 1920s, fudge making parties had become the weekend highlight for children of all ages. Students enjoyed the economy of making fudge on campus, and there was no end to the variety. Fudge squares were sometimes decorated with icing for fancy occasions and to add greater appeal. Cookery experts published the latest and best fudge recipes in all the popular newspapers and family magazines. Kids learned how to make fudge candy as a normal part of growing up. A family picnic or an evening's game of cards never seemed complete unless there was a plateful of freshly made fudge available to munch on. It had become a familiar part of everyone’s life. For practice in making the Queen of Candies, here's a rare, vintage fudge recipe for making what was called Educated Liberty Fudge. Ingredients: 3 squares candy-making chocolate, 1/2 cup water, 1/2 cup Evaporated Milk, 1 cup granulated sugar, 1/2 cup brown sugar firmly packed, dash of salt, 2 tbsp butter, 1 tsp vanilla, 1 cup broken walnuts. Add chocolate to water and milk and place over low heat, cook and stir until blended; add sugar, salt, stir till it boils; continue boiling without stirring till soft ball stage; remove, add butter; cool, add vanilla, then beat till it thickens; add nuts and continue beating till it loses its gloss; turn into greased 8x4-inch pan, cut in squares. Add 1 cup sifted confectioners' sugar to 1/2 egg white, then beat, then use for decorating; pipe a letter of the alphabet on each square of fudge. 2-1/2 cups brown sugar, 2 teaspoons flour, 1/2 cup milk, butter size of walnut. Stir ingredients and boil 20 minutes. Add nuts later if desired. Beat with wooden spoon until mixture starts to thicken. Put in pan and mark in pieces. Set out to cool.